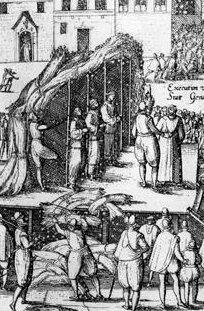 On June 28, 1578, five Catholic monks were burnt to death in Ghent for homosexuality. At our scene in the Spanish-controlled Low Countries, the revolt that would become known as the Eighty Years’ War and secure Dutch independence still had about 70 of those years to run. Stadtholder William of Orange, aka William the Silent, has his hands full with the Habsburg forces determined to crush their disobedient subjects. Half civil war, half proto-nationalist revolution, this conflict overlaid disputes over both political and religious authority, complicated by a catastrophic Spanish bankruptcy. Late in 1577, a political coup in the commercial powerhouse of Ghent did just that, part of a mini-Renaissance of Calvinist city-republics that Spanish arms would truncate in the 1580’s. 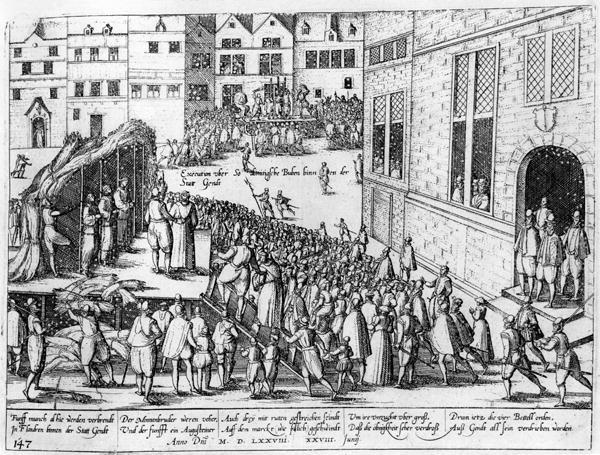 But here in the 1570’s, the newly elevated slate of Calvinists implemented a “Reform” agenda that included aggressive moves against Catholic authority. Rumors of homosexuality in the religious orders swept the overheated city (assuming they were not put about intentionally), and this day opened a summer’s terror that saw 14 monks burned (pdf) for the love that dare not speak its name. William the Silent, made of more statesmanlike stuff than these zealots, would actually enter Ghent himself the next year to disarm the ruling clique, realizing that firebrands were driving Catholic cities back into Spanish arms. But he could not contain the schism. Spain ultimately kept the Catholic-leaning territories that today comprise Luxembourg and Belgium (including Ghent), while the Protestant Netherlands fought onward to independence. Minderbroeders have nothing to do with bawdy stuff. They were a monastic order. I live next to the ‘MINDERBROEDERSSTRAAT’ and the Minderbroederschurch’ wherein Margaretha of York (the diabolical Aunt) is burried. Mentally ill person is mentally ill.
…and speaking of mental illness: this obscene quintuple homicide in Ghent! You know, I hope these monks really WERE “sodomites”: they might as well as have had the fun of it, since, in this particular zealous fury, they were undoubtedly going to die for it whether “guilty” or not. Subject: HIRE ME AS A SYNDICATED COLUMNIST. Subject: Gay Jews conspired with gay Rome to re-write the Bible centuries before the female Christ. Authenticated by history books prior to 1950, laws given by God to Moses are not published in today’s Bibles. Exodus 34:28 mentions these ordinances but does not list them. Jesus referred back to these when She declared the Law of Moses is summed up verily [truthfully]: “Love the Lord your God with all your heart, all your strength and all your mind [obey your Conscience.] Have no other God before you [your Conscience]. Love your neighbor as yourself [keep his Conscience pure but keep yours pure FIRST]. In this one command is all the Law fulfilled.” Believing is easy when truth is simple, logical, irrefutable. Covering up truth is an art. Gays started propagandizing public opinion since Abraham. A bright and beautiful woman appeared to Abraham at an alter he constructed to praise God for victory over a gay tribe that took captive his nephew Lot and all his belongings. Abraham referred to her as a member of the secret Order of Melchisedek. It is written she came from a mystical land called Salem. High priest Joshua reported that Abraham gave this angelic being a tenth of all he had and worshipped her. Her name is the same as Jesus‘, Venus, bright and morning star. In truth, King of Salem was/is Queen of Heaven, the Queen of Heaven witnessed by Bernadette. The big secret in Christianity is that Jesus was a woman. Every name for Jesus in the Bible is female. Venus, bright and morning star, evolved into Jesus when, at Her crucifixion, Her beauty was marred and sexually violated. King David had a vision in which he saw a woman sitting on The Everlasting Throne. Prophet Jeremiah wrote of King David: “I was glad when I saw it was not a man–but a woman.” The second cover-up is that Messiah Venus was Gentile, not Jew. At the head of gay media, Rome conspired with gay Jewish interests 3000+ years ago and organized crime through Religion. “Ten commandments” shoved down our throats today are gay, sick, perverted, occult, child-molesting, wife-beating and sadomasochistic. Venus’ one command destroyed the ten we are led to believe came from the mouth of God. She declared “I am the voice that spoke to the prophets” and commanded homosexuals killed. Venus commanded child molesters killed. Every person in the Vatican comes under condemnation of Venus Christ. Ascribing sick laws to an overlooking God Who does not Judge is Heresy, Tyranny and High Treason. The song “Venus” is about Jesus. There is no God but the true God, and Bonnie Bass is His Messenger [Messiah]. HIRE ME AS A SYNDICATED COLUMNIST.